Well, there is nothing I like more than settling down with a cup of tea and something to read. I have always had a passion for current affairs and in our century there was always something exciting happening somewhere in the world, sometimes on your own doorstep. On a chilly, misty day like this one a lady doesn't always want to venture out to the print shop and so I was very pleased when, on this date in 1702, the estimable Elizabeth Mallet published The Daily Courant. The Courant was the first daily English language newspaper to be published in Britain and Mallet produced it from her premises beside the Kings Arms on Fleet Bridge. It was, of course, only one page, so no troublesome glossy supplements to clutter up the salon, but one could read reports of the news of the day and then turn over and browse advertisements on the reverse. Mallet's intention was to present only overseas news and to offer no opinion or bias, believing that her readers were intelligent enough to draw their own conclusions on important matters. Well aware that a female name on the byline might not endear her newspaper to the public, Mallet published the Courant under the name E Mallet. She passed ownership of the paper to Samuel Buckley in 1703 and then faded from the annals of history until 1706, when reference can be found to her estate, suggesting that Mallet was dead by this date. Buckley, of course, went from strength to strength and eventually made his name as the printer of The Spectator. The Courant was not without its controversies though and on 7th April 1712, the paper printed an account of business in the House of Commons translated from a Dutch source. Publishing the business of parliament was a serious matter and Buckley was punished with a hefty fine for his wrongdoing. 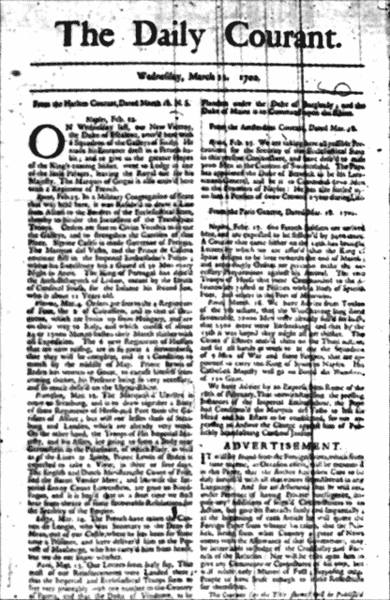 The Courant continued for 34 years under Buckley's stewardship and in 1735 it merged with the Daily Gazetteer. Buckley himself passed away five years later, his place in the history of printing assured. A very interesting tale about a Lady who should be more acknowledged.